We study frozen percolation on the (planar) triangular lattice, where connected components stop growing ("freeze") as soon as their "size" becomes at least N, for some parameter N ≥ 1. The size of a connected component can be measured in several natural ways, and we consider the two particular cases of diameter and volume (i.e. number of sites). Diameter-frozen and volume-frozen percolation have been studied in previous works ([25, 11] and [27, 26], resp. ), and they display radically different behaviors. These works adopt the rule that the boundary of a frozen cluster stays vacant forever, and we investigate the influence of these "boundary conditions" in the present paper. We prove the (somewhat surprising) result that they strongly matter in the diameter case, and we discuss briefly the volume case. van den Berg, J, & Nolin, P. (2016). 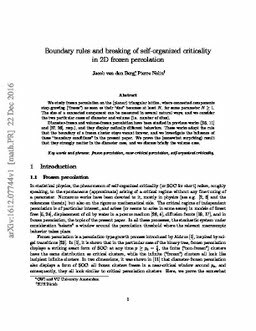 Boundary rules and breaking of self-organized criticality in 2D frozen percolation.